With more than half of all Google searches taking place on mobile devices, it’s necessary for businesses to ensure their websites are easy to access and navigate on smartphones and tablets. 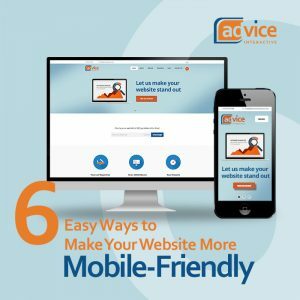 Mobile-friendly websites load quickly, display properly for mobile visitors, and often use responsive design, thereby allowing businesses to maintain a consistent brand image, improve customer experiences, and boost conversion rates. Mobile devices have considerably less screen space than desktop computers, so it doesn’t take much for a website to appear cluttered on a smartphone. Streamlining the design with a single-column layout and removing non-essential features can make it easier to view, navigate, and interact with a website on mobile. Making each page accessible from a collapsible navigation bar or mobile accordion menu ensures consumers can always find exactly what they’re looking for. With responsive design, everything on a website shrinks to fit the screen size – including calls-to-action and interactive buttons that visitors might want to tap. Increasing the size of important buttons and ensuring there is enough white space between them saves mobile consumers the well-known frustration of tapping the wrong button. Additionally, using a large, clean font makes it easier for customers to find information and interact with the website on a smaller screen. Check out the Digital Swarm wholesale websites for some examples. The last thing consumers want to encounter on mobile is a wall of text. That’s why businesses with separate websites for mobile and desktop often include less written content on the mobile version of their site. However, it’s possible to improve the user experience without creating two versions of a website simply by shortening paragraphs or breaking up text with images and links. Mobile users can browse the web from anywhere, which means auto-playing video content can be embarrassing as well as generally unpleasant. As a general rule, businesses should steer clear of any content that could potentially annoy consumers, such as pop-up ads or unexpected sounds. Auto-playing videos can also increase the page’s bounce rate – especially if the consumer finds it easier to leave the site than to turn off the video. Since mobile users often perform searches in the middle of another activity, they don’t have the time or patience to wait for a slow website. The longer a business’s website takes to load, the less likely mobile consumers will stick around to browse or make a purchase. Reducing image and video files can minimize a website’s bounce rate by improving page load times. Take advantage of any mobile-specific functionalities that provide a smoother user experience. One of the best opportunities to connect with mobile consumers is found in the fact that smartphone users are just a click away from calling a business. Including click-to-call buttons is an effective, convenient, and mobile-friendly way to increase conversions.